Trottier Observatory and Science Courtyard at SFU: Wheels Up! 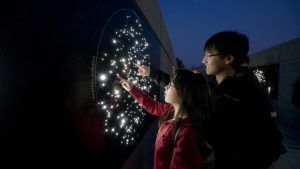 Simon Fraser University’s Trottier Observatory and Science Courtyard had its official opening on Friday April 17, with a morning ribbon-cutting presided over by SFU’s President, Andrew Petter, and an inaugural public star party that evening which drew almost 2,000 people! 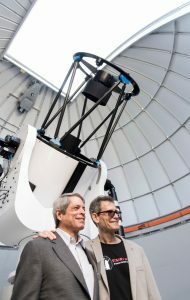 This day was also a watershed moment in the long partnership between SFU and the Vancouver Centre of the RASC, which has now entered a new and exciting phase, centred around the exploitation of the observatory for public outreach, for student education, and for use by members of the Centre. Vancouver Centre’s major contributions to sfu’s astronomy outreach program over many years, as well the Centre’s participation in the development of the observatory and science courtyard, were formally recognized at the official opening in speeches by sfu’s President Petter, Vice-President of Advancement Cathy Daminato, and Dean of Science Dr. Claire Cupples. 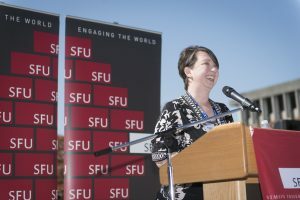 Vancouver Centre’s very own Vice President and Events Coordinator Suzanna Nagy also gave an address at the opening in which she highlighted the collaboration between the two institutions, and the exciting possibilities for future joint efforts that will be made possible by the observatory. The collaboration between SFU and the Vancouver RASC took off in 2009 with an intense year-long effort that brought the International Year of Astronomy to SFU’s Burnaby campus (among the Centre’s many other iya events), where we hosted thousands of kids and their families at nearly a hundred daytime astronomy workshops and evening star parties; with the support of the Vancouver Centre, SFU also donated about 85 small refractors to schools and families that year. In the years since the 2009 IYA, the partnership between SFU and Vancouver Centre has grown ever stronger and our collaborative efforts have diversified considerably. As our members know well, the Centre now routinely hosts our monthly public lecture, as well as our annual Paul Sykes Memorial Lecture, at SFU , with SFU providing meeting space and AV services free of charge. Vancouver Centre also hosts its annual Astronomy Day in concert with SFU’s annual Science Rendezvous event, which draws thousands of young families every year. 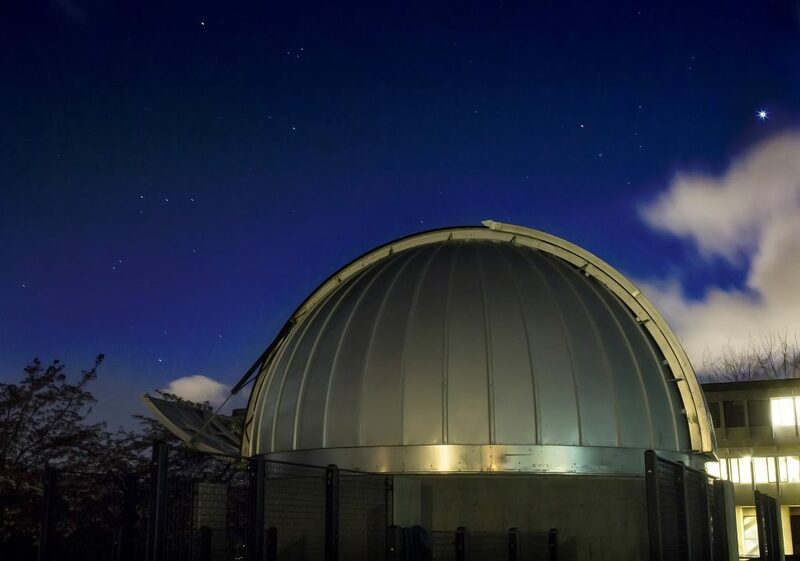 The new observatory at SFU houses a state-of-the art 0.7m aperture telescope on a fully robotic alt-azimuth mount; this turnkey CDK700 system is built by PlaneWave Instruments, located in Rancho Dominguez, California. The observatory has a 20-foot diameter Ash Dome, with an electronic dome control system built by ace Instruments. The remarkable optical design of the CDK700 produces razor sharp stars over a huge 70mm imaging circle, and we will take full advantage of this capability with our 16-megapixel high-resolution cooled camera, built by Finger Lakes Instruments, complemented by a complete set of high quality broad- and narrowband filters supplied by Astrodon. 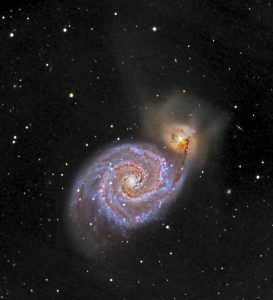 Eager to assess the imaging potential of this exciting system, I shot this image of the Whirlpool Galaxy at the end of the first full night of operation after the observatory opened—not too shabby, considering that this was only twenty minutes of exposure through a luminance filter, shot through cloud that at times obscured the stars in the handle of the Big Dipper! (Full disclosure: I didn’t get around to imaging through the colour filters that night, so I colourized the luminance using the very first—and very crude—image that I took at my own observatory in the Okanagan, which also happened to be of the Whirlpool). Soon to come is a high resolution echelle spectrograph on order from Shelyak Instruments, in France—with this instrument we will be able to measure the periods of spectroscopic binary stars, produce Hertzprung-Russell diagrams of star clusters, and possibly measure the redshifts of the nearest quasars, among many other applications. It may come as a surprise that the largest part of the capital cost of the project was not taken up by the observatory, but by the science courtyard that it anchors. While the project was originally conceived of as a variation on the traditional university teaching observatory (albeit with a large teaching space devoted to science outreach for public schools and home-schooled families), it was transformed into a high-profile public space when the university generously provided an extraordinary site, immediately adjacent to the centrepiece of the Burnaby campus, SFU’s iconic Academic Quadrangle, an architectural masterwork by Arthur Erickson. The site is meant to serve a new focal point for campus and community life, and is a very visible statement about the importance of science to society. While the observatory is the most prominent structure on the site, the space is filled with architectural landscape elements, big and small, that represent the science of astronomy, and which allude to the beauty and mystery of the universe as revealed by science. One of the largest and most novel architectural elements is a set of two huge concrete walls that are meant to represent an ancient observatory with a fixed slit view of the heavens, such as existed in Mesoamerica thousands of years ago. The walls are adorned with huge, realistic, seasonal star charts that are illuminated at night. Paul actively pursued his interest in astronomy, attending conferences and joining the R.A.S.C., where he became a Life Member. Paul Sykes passed away in October 2005 at the age of 87 and left the Vancouver Centre a generous gift.